Depicting then-President George W. Bush as a fan of the AdSurfDaily MLM HYIP “program” backfired in spectacular fashion in 2008, drawing the attention of the U.S. Secret Service. Federal agents eventually seized more than $80 million in an asset-forfeiture case. ASD President Andy Bowdoin, accused of operating a cross-border Ponzi scheme, was indicted. He later pleaded guilty to wire fraud. Bush left the White House in January 2009, after Barack Obama was elected President. By August 2010, according to the FTC, “medical discount” hucksters were trading on Obama’s image. MPB Today operator Gary Calhoun later was charged with racketeering. Assets were seized. A conviction followed. In 2013, with Obama now in his second term, he was depicted in a promo as a pitchman for a scheme known as Ultimate Power Profits. That “program” had promoters in common with Zeek Rewards, which the SEC described in 2012 as a combined Ponzi- and pyramid scheme that had gathered hundreds of millions of dollars. Against this backdrop, a YouTube video that appeared online today positioned Obama as a pitchman for MyAdvertisingPays, a Ponzi-board scheme like ASD, MPB Today, Ultimate Power Profits, Zeek and many others. 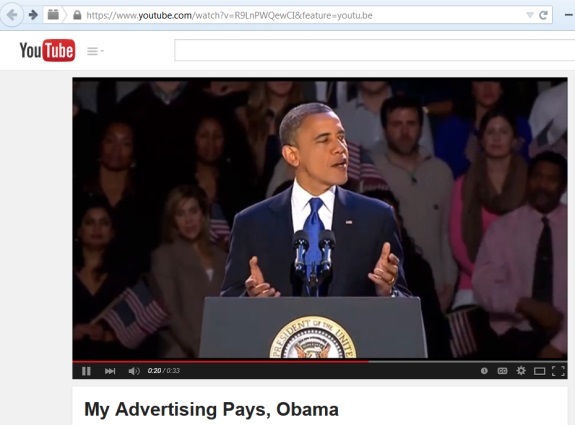 News about the 0:33 MAPS’ video titled “My Advertising Pays, Obama” first appeared on the RealScam.com antiscam forum. The video for MAPS puts MAPS-friendly words into the President’s mouth.